It is an endowment programme started in 1992 to remember the services of Rev. Sr. Loyola, our former Principal. It is a training programme organized by the Department of Home Science for selected non-Home Science students from various colleges of M.G. University. Chethana is an endowment programme started in 1995 to remember the services of Rev. Sr. Lourdes, our former Principal. It is conducted by the Department of Chemistry as a one day seminar for mothers of our students with a view to enlighten and empower them. This is a philanthropic gesture under the initiative of the National Service Scheme of the college with a purpose to nurture th virtues of love, kindness and concern for fellow human beings. Students are encouraged to share their meal with the destitute once in a month thereby becoming partakers in social development. Lunch packets thus collected on all first Fridays are distributed to the inmates of Abhayabhavan Koovappady. Staff and students visit nearby charitable homes where desolate and aged people are looked after. They spend their time there and make themselves useful to the inmates by helping them to clean up, entertaining them and sometimes by just istening to them. 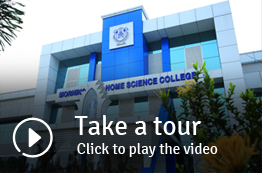 The Department of Home Science offers short courses of four months duration twice a year and of one month duration during summer vaccation to the outsiders.